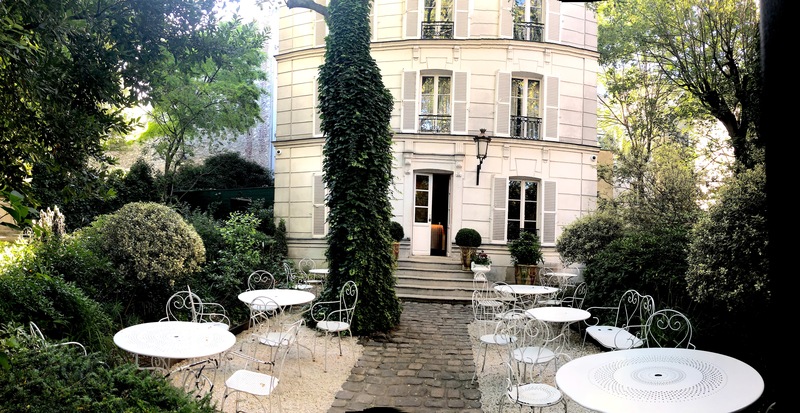 Arriving in Paris and stepping into the courtyard full of lush greenery, quintessential white iron bistro tables and a façade offering as much luxury on the outside as on the inside, is to soothe the exhausted traveler’s mind. 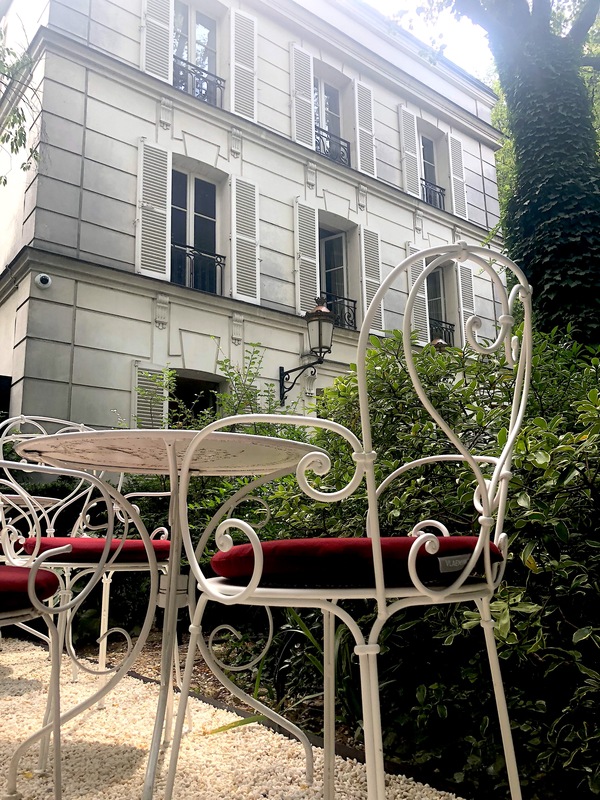 Exactly what I had hoped, Hôtel Particular Montmartre is a luxurious gem to call home for the weary traveler that begs to feel at home. As I shared in this Instagram post immediately after unpacking my bags and settling into the city, its was the soaking tub and a brief nap that enabled the jetlag to fall away far more quickly than I had expected. 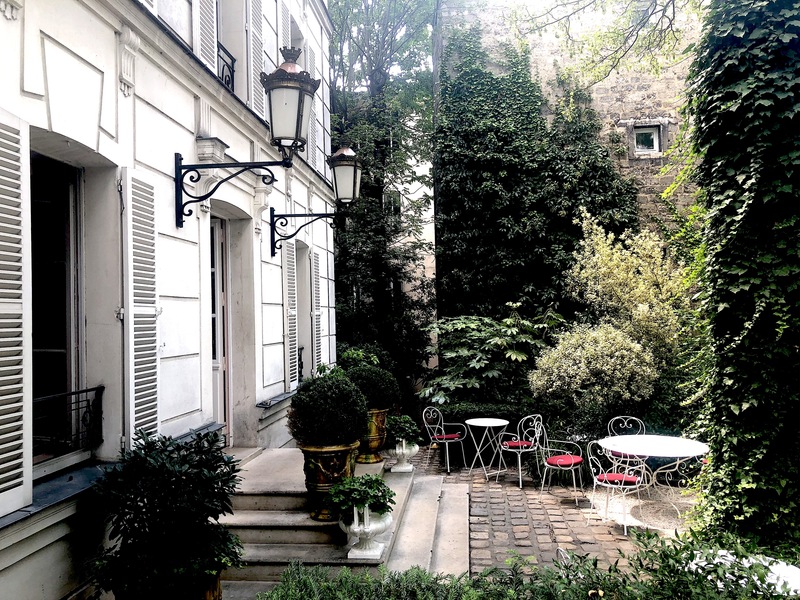 From my third floor French windows (my suite had five making me feel truly spoiled), I could peer down onto the courtyard, and fall asleep to the late-night Parisians enjoying an aperitif well after dinner (is it still an aperitif when it’s after, not before dinner?). 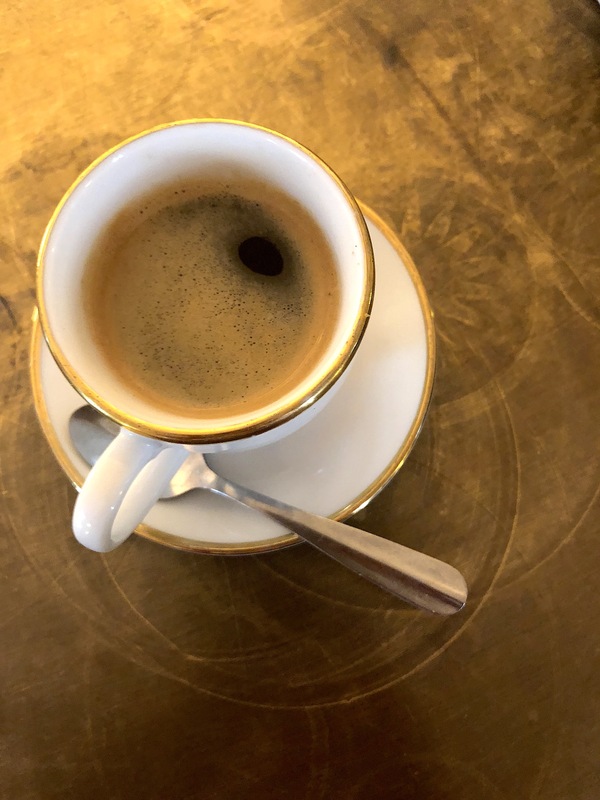 While the accommodations are an opportunity to spoil yourself, I wanted to bookend my trip (two nights upon arrival, and one night before departure) with as little stress and as much comfort as possible as I knew I would be traveling quite a bit throughout my month in France. The concierge, Antoine, was a pure delight, and between his little English and my barely-any French, we eventually figured out how to communicate, but his smile was always present, and his help with my luggage, deeply appreciated (as it had grown upon my return for the last evening). As well, he made reservations for me at a recommended seafood restaurant in the neighborhood for my last evening at La Mascotte, and I could not have had a more lovely punctuation to a most memorable trip (thank you Antoine). 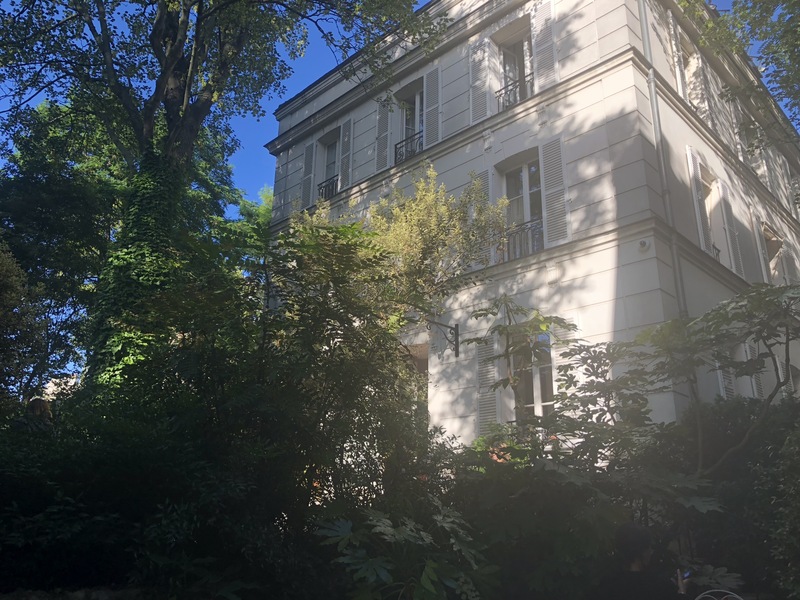 Tucked up in hill of Montmartre, guests will feel they are not in the busiest tourist city in the world, but out in the country as the chirping of the resident birds was the symphony I heard each morning. And each evening a game of pétanque was played amongst the locals just outside my window in the neighboring park. 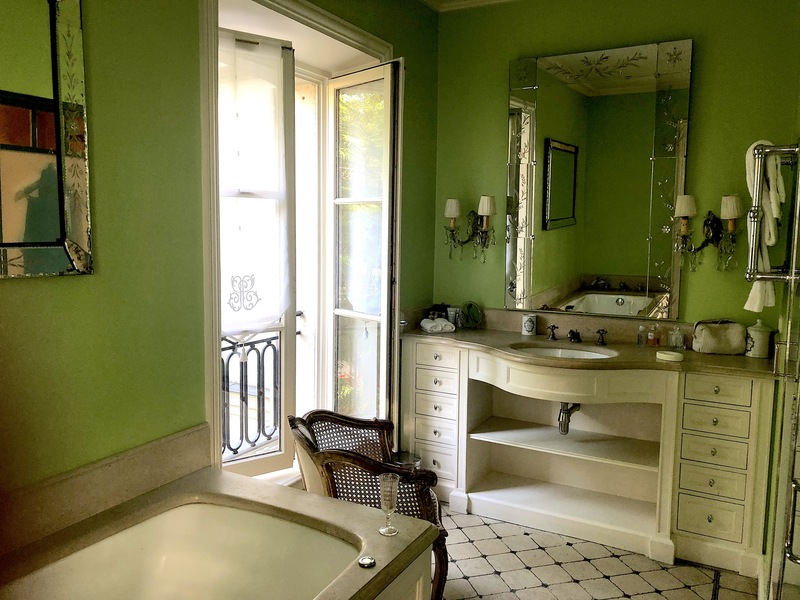 To be in Paris and have a touch of the countryside was the perfect pairing for my type of preferred traveling accommodations. ~Learn more about Hôtel Particulier Montmartre here. 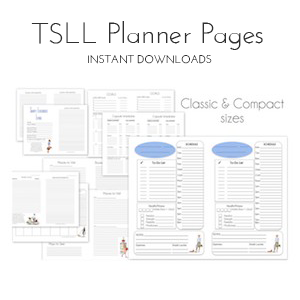 TSLL’s 3rd Annual French Week continues through August 19th with at least two posts per day. À bientôt! What a lovely setting to launch your French countryside adventure. Looks so comfortable and luxurious. That bath area is just wonderful. And I appreciate that you highlight that this location afforded the sound of a fountain nearby in which to aid with sleep. Brilliant! I wonder if a fan is standard equipment in your room rentals.